The Janet Seidel Quartet featuring Chuck Morgan. In 2014, Janet opened her U.K. tour here in Felpham before going on to appear at numerous U.K. venues over the following 3 months including Ronnie Scott’s. With Janet’s vocals, the quartet proved to be very popular at every venue resulting in many requests to return. 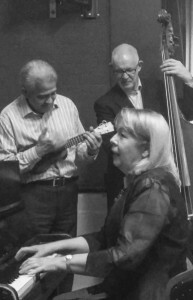 So we will be delighted to welcome Janet and her fellow musicians back to the Village Hall when of course, they will be joined by our own Bobby Worth.